Every year around this time, Canadian snowbirds flock south to Florida. You don't need binoculars to spot these birds--tens of thousands of them blast through the central and eastern U.S. states in a conga line of cars, RVs and motorcycles. Most of them are hard drivers, one eye on the gas gauge, the other on the GPS, and no fooling around. Because in this crowd, the quicker the trip, the bigger the bragging rights. But a full-on fast forward through a landscape of fuel plazas, food chains and no-frills motels? Fifty shades of boring. 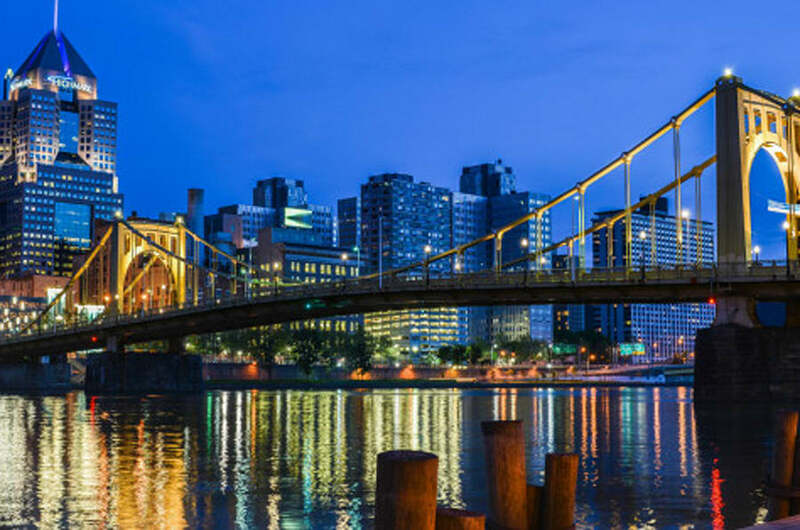 If you've never been to Pittsburgh, forget everything you think you know about it and spend a couple of days enjoying some under-the-radar awesomeness. From Toronto, it's just 6 hours and a tank of gas away. We left on a Friday morning and arrived in time for cocktails in the Cultural District, 14 blocks of theatres, restaurant and galleries in Pittsburgh's downtown Golden Triangle. Our spacious digs at the Omni Renaissance Hotel, a stylish 4-star landmark refit, were perfectly located for a stroll through the district before dark. We were astonished at how many performance venues and eye-candy buildings we stumbled across on the way. The architectural surprises ranged from the classic old Dollar Bank building, complete with stone lions, to the neo-Gothic PPG Place, with its postmodern take on turrets, to the LEED-pedigreed Convention Center on the riverfront. At the tip of the triangle is the Point, a park where the Allegheny and Monongahela come together to form the Ohio River. Good looks, great style, and a past. Pittsburgh and good looking: words that seemed incompatible pre-visit now seemed like a natural fit. Once an industrial era superstar, a wealthy railroad town with a huge production of iron and steel, the city has transitioned brilliantly into the 21st-century with some revitalized glories of the past. Pittsburgh has more than good looks; it has great style. At the Grand Concourse Restaurant in the repurposed Pittsburgh & Lake Erie Station, we opted for a table on the glassed-in platform and had dinner as boats and the occasional freight train rolled by a riverfront view of the city at night. Afterward we rode the Duquesne Incline, an original 19th-century cable car still used by urbanites as part of the public transit system, to catch the view from Mt. Washington. In a city with more than 400 bridges, you can't help but feel connected. The only trio of identical bridges built in the U.S., known as the Three Sisters, crosses the Allegheny to the North Shore. They are named after local cultural heroes Roberto Clemente, Andy Warhol and Rachel Carson. On Saturday morning, it was a no-brainer to take the Warhol Bridge straight over to the Andy Warhol Museum, which is staffed by people who would look at home at Warhol's 'Factory' if it existed today. From early works to iconic portraits--the original uncut version of the silkscreened silver Elvis series is a standout--a sampling of his kitsch housewares and the boxed 'time capsules' of memorabilia he collected every calendar year, it's all here. You can even take a Factory 'screen test' that uses the original technology, a Bolex camera and 35 mm black and white film, converts it to slowmo and emails you a digital file to share with friends and followers. We drove by Randyland, a one-of-a-kind Pittsburgh landmark, and stopped in to see the installation art by Yayoi Kusama, James Turrell, Greer Lankton and others at The Mattress Factory. Then a quick lunch and a few hours in the amazing Phipps Conservatory, a philanthropic gift from 1893 that keeps on giving. The Phipps has room after room of fabulous plants and Chihuly sculptures and, with its innovative net zero energy Centre for Sustainable Landscapes, is a must-see for anyone interested in greener living. After hours on our feet, we sank into a sofa for tea under the dome in the plush Omni lobby, dashed around the corner for a dinner from Chef Richard DeShantz's gastropub kitchen at Meat and Potatoes, then hit up a fun show at the Cabaret in Theatre Square. Whew, Pittsburgh. Who knew? It's full of charm in a best-kept secret sort of way. But word's getting out, so better be quick. Condé Nast Traveler just named it #3 of their "Top 15 Places to Go in 2015" and yes, "The furnaces are long gone, but this city's on fire." Stay tuned to Huffington Post for the next instalment in this 3-part series.